If you're living with diabetes, you probably know that the disease can impact your kidneys, nerves, eyes, heart, and other major bodily systems, and to avoid complications, it is important to keep your blood glucose levels under control. However, you may not have known that diabetes can also cause issues with your oral health. In order to protect your teeth, it is important that you take special precautions, especially when living with diabetes. What Dental Problems Are the Greatest Concerns for People with Diabetes? • Gum disease. 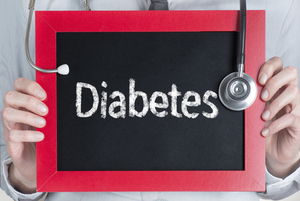 One of the greatest complications associated with diabetes is that it causes thickening of the blood vessels, which can also slow down the flow of nutrients and waste products between the tissues of the body, including the mouth. Diabetes also impairs white blood cells, and when these two situations combine, your body's ability to fight off infections will be impeded. Therefore, diabetics can experience gum disease more frequently than others. • Dry mouth. Uncontrolled diabetes can reduce saliva flow, leaving you with a dry mouth. Symptoms can range from simple bad breath to more serious issues like infections, ulcers, and tooth decay. • Poor oral tissue healing. If your disease is not well controlled, you may have difficulty healing after oral surgery or other dental procedure. The reason for this issue is that the flow of blood to the treatment site could be obstructed. • Thrush. Diabetics who frequently need to take antibiotics to fight off infections will be especially prone to developing a fungal infection of the tongue and mouth. This fungus will thrive on the high sugar levels in the saliva. Smoking makes your risk of developing these issues, even higher, especially for gum disease and thrush. Smoking will impair the flow of blood to the gums, which can impact wound healing, so smoking after a dental procedure can further delay the amount of time it takes you to properly recover. The key to preventing and controlling mouth problems is to properly control your blood glucose levels. At each of your dental visits, be sure that we know about the status of your disease, such as your HgA1C level, as this is a good determinate of how well you are controlling your diabetes. We may also want to know what medications you are taking as part of your diabetes care regimen. A consistent oral hygiene routine, including brushing and flossing is also an important line of defense against dental complications of diabetes. Be sure that you are brushing your teeth at least twice daily using gentle but firm strokes. Flossing is also essential in removing plaque from under the gums and between the teeth, so be sure to floss at least once per day. Additionally, you should always be on the lookout for early signs of gum disease, including bleeding gums, swelling, loose teeth, mouth pain, and tenderness. When Should I have a Dental Check Up? If you are having difficulty with keeping your blood sugar under control, you should speak to both your doctor and us about receiving elective dental care. If you are in need of a dental procedure, it should be completed quickly and a stress free manner, and because glucose levels are usually under better control in the morning, you should make your appointments for this time of the day. As your dentist, we care about both your oral and overall health, and we need to see you on a regular basis in order to properly monitor you. Please call us today to set up your next appointment.